Twenty-five years ago, a Roselle Park, NJ man bought an 1892 stock certificate because he suspected it was a fraud. 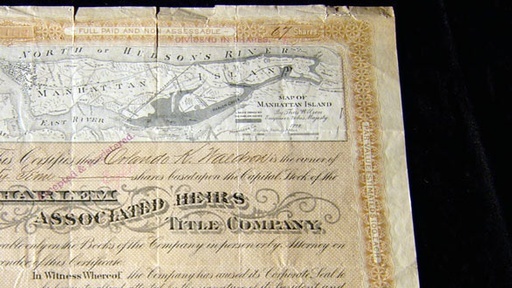 The certificate bears the name Harlem Associated Heirs Title Company and includes a detailed map of Harlem. The elaborate illustrations make our contributor suspicious. The more ornate stock certificates he’s seen in the past have been scams. Furthermore, he’s researched and cannot find anything about a Harlem Associated Heirs Title Company. He turns the case over to the capable hands of History Detectives host Gwendolyn Wright. Gwen discovers this certificate serves as an extravagant bookmark in an often forgotten chapter of Harlem's history. Also in this episode Chandler Tintype How did this Civil War era tintype help re-ignite a fiery debate about African Americans bearing arms for the confederacy?